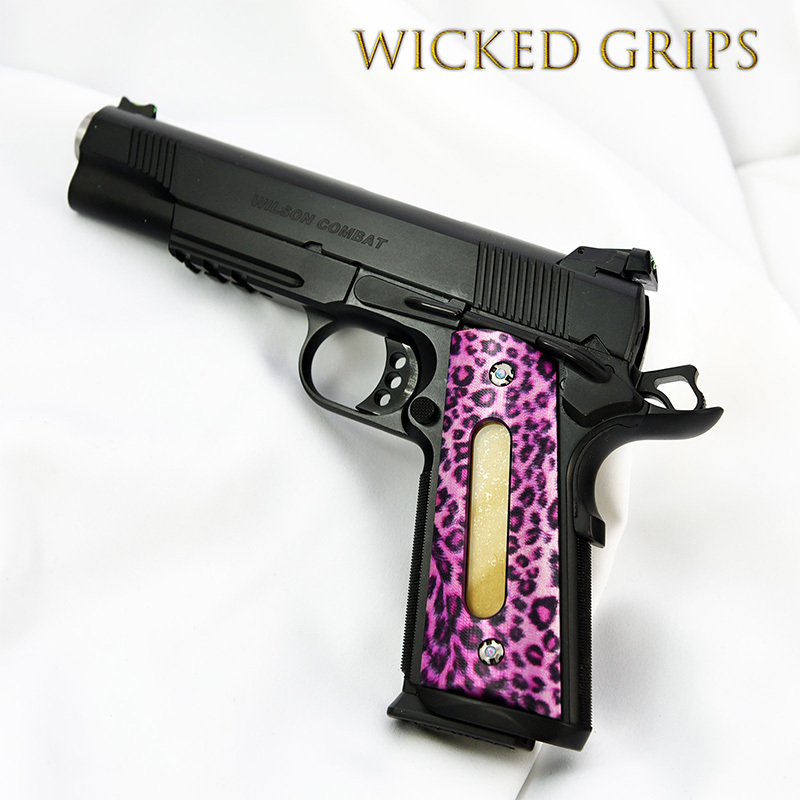 CUSTOM 1911 GRIPS "DOUBLE WINDOWED PINK CHEETAH"
CUSTOM 1911 GRIPS ALUMINUM NEW DOUBLE WINDOW SERIES PINK CHEETAH… AS VIEWED ON DAN WESSON VALOR 5″ FULLSIZE 1911. LAST SETS AVAILABLE FOR THIS SERIES! 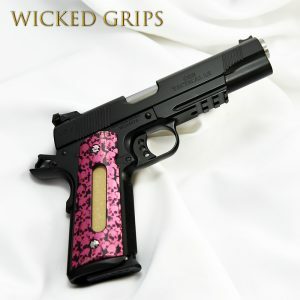 PICTURED WITH OUR EXCLUSIVE PINK OPAL GEMSTONE GRIP SCREW SET, NOT INCLUDED BUT AVAILABLE SEPARATELY. 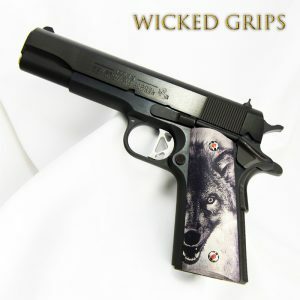 EACH SET HAS A MILLED SLOT ON BOTH SIDES WITH A PLEXIGLASS WINDOW TO ALLOW VIEW OF MAGAZINE LOAD OUT… WORKS WELL WITH WILSON 47D AND OTHER “SLOTTED” 1911 STYLE MAGAZINES! THESE GRIPS COME WITH A PROTECTIVE PAPER LAYER OVER THE GLASS ON THE BACK OF EACH GRIP WHICH CAN BE REMOVED BEFORE INSTALLATION. 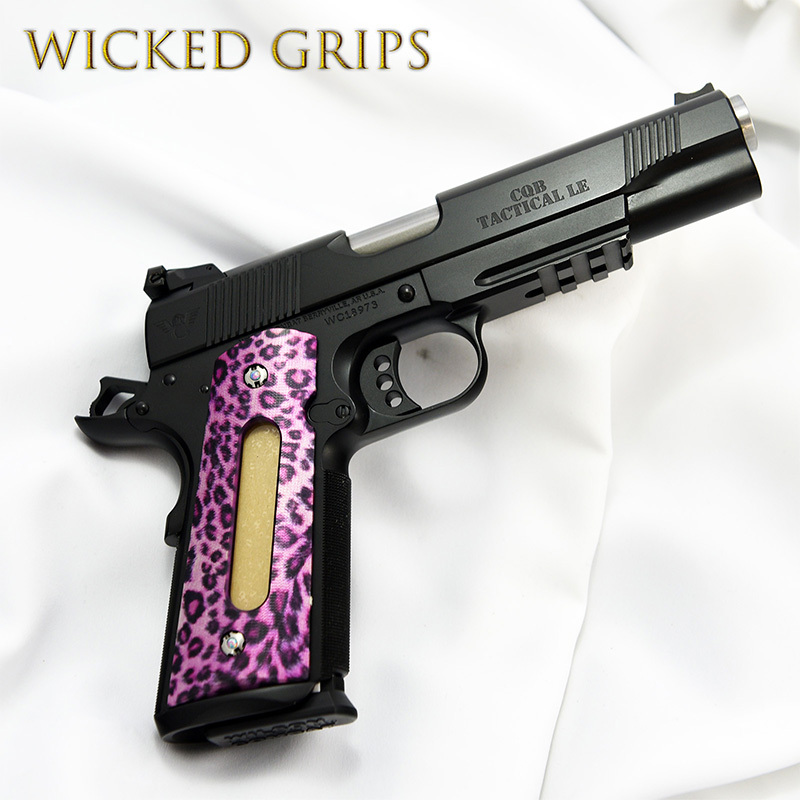 IN AN ARTISTIC COLLABORATION WITH OUR FRIENDS OVER AT ALUMAGRIPS, WE’RE PROUD TO BRING YOU THE FIRST SERIES OF CUSTOM, TRUE ANODIZED WICKED GRIPS ALUMINUM 1911 GRIPS. TRUE TYPE II ANODIZED.. NOT PAINT.. NOT VINYL. 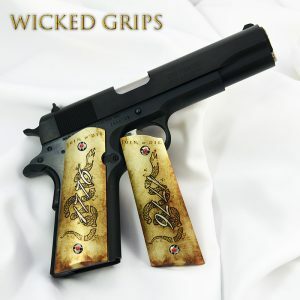 Each set we create here at Wicked Grips is based on hours of art, style and design… with each art piece created to flow with, and not against the shape of the grip, and the firearm. This design is limited to 50 sets, and then discontinued. 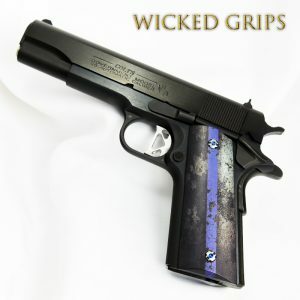 EACH SET IS BASED ON AN ALUMAGRIPS PANEL, DISCREETLY FIT FOR AN AMBI SAFETY, WITH A MAGWELL/SEMI CARRY BEVEL BOTTOM FIT, SO THEY WILL FIT ANY BASIC 1911 FULLSIZE FRAME CONFIGURATION.